As a blogger, content thieves can be one of the most infuriating things to deal with. We DIY bloggers can work HOURS on one single post–doing the actual project, taking the photos of each step, editing the photos, writing the instructions. It’s hard work, and takes a tremendous time commitment. So after all of those hours of work, a content thief comes along, swipes your post (including all of the pictures) from beginning to end, and reposts it on their blog that is usually filled with pay-per-click advertising. In a matter of minutes, they’ve stolen the very thing that you worked hours on, and now they’re making money off of your hard work. “Infuriating” doesn’t even begin to describe it!! 1. Determine if the offender is really a content thief. To call someone a “thief” is really quite a strong accusation, and one that you don’t want to make lightly. There are many, MANY new bloggers out there who may have the best intentions, and want to share your post with their handful of readers, and simply don’t know (yet) that reposting another blogger’s post in it’s entirety is a big no-no. When I happen upon one of these newbies, I make every effort to handle the situation in private, and with as much kindness as I can portray in an email. I don’t want to come across as being so harsh, mean, or angry that I scare them away from blogging completely. Newbies need to be taught, and I try to take that opportunity to pass along some helpful blogging tips, while at the same time, requesting that they remove my post and replace it with an excerpt and a link to my post. They usually respond with something like, “Oh my gosh, I had no idea! I’m so sorry! I just loved your project so much that I wanted to share it.” So everyone’s a winner. They’ve learned something new and valuable as a new blogger, I still get my “shout-out” on their blog, and I have kept my original content safe and sound on my blog. So there are newbies who don’t know better…and then there are content thieves. With the thieves, I’m not too concerned about kindness. More times than not, these content scrapers will not have any contact information on their blogs. They don’t really WANT anyone contacting them. They simply want to steal content and repost it on their blog that generally has tons of pay-per-click advertising in an effort to make easy money off of someone else’s hard work. After you press “Search”, it’ll bring up the information for that domain, including a contact email and mailing address, and a phone number. You can then use that contact information, and send them a demand for removal of your copyrighted material from their website. Be sure to give them a deadline, and tell them that you will take further action if your content has not been removed by that time. 3. Contact the offender’s domain registrar. If the offending blogger or website owner has not responded within the set amount of time (or if the Better Who Is information did not show the actual website owner’s information, but rather, showed some proxy information), the next step is to contact the domain registrar/website host and file a complaint with them. The registrar information can also be found on the Better Who Is listing for that domain. You may have to provide proof that the content belongs to you, but the domain registrar/hosting company will let you know exactly what you need to do, and if they will be able to help you. They may send legal notice to the offender/content thief. Update: You will need to send the offending website’s ISP a DMCA Takedown Notice, and there are specific requirements for this notice. I happened upon this fantastic explanation of how to write a DMCA Takedown Notice. 4. If the offending blog is not on it’s own domain, contact the free hosting company. If the thief’s blog is hosted in Blogger or WordPress.com, you can contact the hosting company and have the content removed. I’ve never had to contact WordPress.com about a content thief, but I can tell you from personal experience that Blogger responds very quickly (within about 24 hours) to claims of copyright violation, and they will remove your content from a thief’s blog with no hesitation and no questions asked as long as you provide adequate proof that the content belongs to you. If someone has stolen your content and placed it on a blog hosted by Blogger, you can use their online form to file a complaint. Be as specific as possible, and give them all of the requested information, and your content will be removed from the thief’s blog. Unfortunately, you do have to give the URL of each and every post that the thief has stolen from you, which can be a very long and drawn out process if you’re dealing with a content scraper who’s using your RSS feed to fill up their blog with your posts. I’m not sure about the specific process for WordPress.com or any other free blogging host, but I can assure you that they do have some remedy for copyright violations. You’ll just have to Google and/or find the information on the host’s Terms Of Service or other information pages. 5. When all else fails, send content thieves an interesting photo in place of your actual photos. Content scrapers take everything…your entire post from beginning to end, including the URLs to the locations on your server of any of all of the photos in your blog post. If you’re on a self-hosted blog, e.g., a WordPress blog hosted on HostGator or another website host, then that means you are paying a monthly hosting fee based on the amount of traffic your blog receives. The more traffic you get, the higher the cost of website hosting will be because you use more storage space and more bandwidth. The good news is that if you’re on a self-hosted blog, and you have access to your Control Panel (which you should), you can re-route all of the requests for photos on your server to another photo that you specify. That means that when one of the thief’s readers tries to read your post on the thief’s blog, instead of your server sending over the photos that are specified in the blog post, your server will instead send an alternate photo. The first thing you want to do is click the button that says “Enable” at the top, so that you enable hotlink protection. Next, you want to list all of the websites that you’ve given permission to publish your posts. If you have other websites or blogs, including subdomains, you’ll want to include those. Also, add things like your Feedburner feed URL, Google (so that people can still see your pics on Google Reader), and any other site where people are allowed to read your blog feed. Then in the box that says “Redirect Request to This URL”, you’ll put the URL to the alternate photo that you created. Be sure that the URL ends with .jpg, or .png, or .gif, or another picture file extension. This URL must be directly to a picture, not to a webpage. Please note that this last option will send your alternate photo to ANY website that uses photos from your server, and hasn’t been specifically listed in the “Allow Access” box. That means that if you have a blog button that is on your server, and you provide the code for other bloggers to add your button to their blogs, they will now be sent the alternate photo. You can remedy this by uploading your blog button to a place like Photobucket or Flickr, and then adding that URL into the blog button code. However, any blogger with the old code will still be sent the alternate picture until they update their code. That also means that if you have guest posted for another blogger, and you stored the photos for the post on your own server and included those photos in your post, that blog will now be sent the alternate photo on your guest post UNLESS you add that blog to the “Allow Access” box. Also note that this option does NOT remove your actual content from the thief’s blog. However, the hope is that they will see all of the alternate photos filling up their blog, finally realize that it’s not worth it to steal from you, and remove your posts from their blog. Thanks for posting – great info for those in need. How frustrating for those that get content taken. Question – you said somewhere in there about someone taking your “copyrighted” material. So if you start up a blog (I haven’t done so yet but would like to try), how do you get your information copyrighted? I’m guessing you have to go an extra step once you start a blog. Thanks for any advice you may have time to pass on. I don’t condone stealing other peoples content AT ALL, but I do have a question. If you are just sharing or showcasing someone else’s post because you like it, and you clearly are not taking any kind of credit for it, what the difference between re-posting the whole post or just a “snippet” ? If you are linking back to the original content what’s the big deal? I don’t get it. Just wondering? The main reason you don’t want to do that is because you’re violating another blogger’s copyright. Written information online has a copyright just like information in a book. If I were to take an author’s book, photocopy it in it’s entirety, and then pass it out to my friends and family just because I liked the book so much and wanted to be sure that all of my friends and family read it, I would be violating that author’s copyright. Same with information from a website. But also, what would be your motivation in reposting someone else’s entire blog post? If you want to feature someone else’s work on your blog, the purpose should be to bring attention…and TRAFFIC…to that blogger as an “atta girl” for a job well done. Posting a snippet, or better yet, posting your own words about the project, including one or two pictures, and then encouraging people to visit the site for the rest of the information is the absolute best way you can show your appreciation for another blogger’s hard work and creativity. 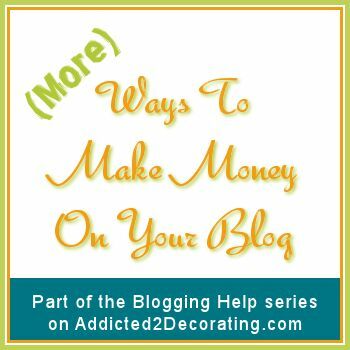 By posting their entire post on your blog, including all of their photos, you have taken away all motivation for your readers to visit that blogger’s site. Whether or not you’ve given a link and credit, you’ve already given your readers all of the information they need about the project, and they have no reason for viewing the content on the original site. It’s mostly about being a courteous blogger. If someone else’s project was so amazing that you wanted to feature it on your blog, then sending them traffic would be the best and most courteous way to “thank” that blogger for sharing the project that you so enjoyed. And you can do that by giving your readers some kind of motivation to visit that blogger’s blog. By reposting the post in its entirety, you completely remove any and all motivation for your readers to visit the blogger’s site. Makes sense. I don’t know why I didn’t think about that. Probably because I am an info junkie, I would go back to the original post just to see if I was missing anything, whether the shared post was partial or the whole thing. oh my goodness, that is stinkin awesome! High five! Woohoo! Great info, Kristi! You sure know your stuff!! I feel for you….what has happened to character/ethics? To think that anyone would need to go to such extremes to get things rectified is maddening. Thanks for the heads-up. I’m curious as to how one would know posts had been taken. Were you alerted by readers? I’m so technologically challenged, I’d probably never figure it out if someone didn’t tell me! Awesome post, Kristi! I am so glad you went further and described what to do, should we ever need to deal with this craziness. I wrote a similar post the other day too. There are many of us that don’t have the time to open up every single post, of every single blog we enjoy. Hmmm, not sure what has changed, but I just went back to my reader, reloaded the page and now I can see all of your images. I’m so glad, because I love your blog. Great tips and great solutions, Kristi! That graphic is hilarious… I’m sorry you had deal with this recently but I appreciate that you are sharing what you did. Thanks for your advice! I just started a blog because I shared many photos on my Facebook wall about great ideas from blogs, and then my friends started asking about the photos. Someone mentioned blogging since I really didn’t want to clog my Facebook. Anyway, I added you to my reading list, and was quite surprised to see the exact topic I’ve been wondering about! Thank you very much! Thanks for all the info. You really did your homework! Hugs and have a great Memorial Day! I follow Pioneer Woman, and she has somehow made it so that you can only repin one of her images. I imagine this is to keep thieves from hijacking all her pics and info. It’s too bad it has to come to this. Where has integrity and imagination gone? I am an email subscriber to your blog. I don’t know how much longer I will be though if the pictures associated with your blog don’t start coming with the emails again. Looking at the new logo picture you developed for those “stealing” your posts is getting old. Don’t know if you are aware of this problem or not. I understand not wanting others to take your pictures and content but thought I would let you know that you are turning off your actual subscribers as well. When we don’t get the pictures that go with a post, many times your post is pretty pointless. I don’t want to have to come to your blog for, I like reading in my email. Thank you. Christy, I apologize for the inconvenience. Unfortunately, I will have to keep the pictures there until the two blogs who are stealing from me remove my posts from their blogs. I hope to get this resolved soon. Email subscriptions are something that I offer on my blog. However, people who only read my blog via email only actually do not benefit me in any way. Readers who actually visit my site are the ones who help me pay the bills. (That’s true of any blog, by the way.) Therefore, my top priority is providing the absolute best content for the people who actually visit my blog each day, as well as protecting my content from people who steal from me. It makes me sad that you don’t find my blog posts interesting enough to click a button and actually visit my site in a way that would actually benefit me and would basically “reward” me for the hours and hours that I put into my site and my projects, but that’s totally your decision. Great info! I am getting ready to launch my website and this is an awesome tidbit. From keeping credit for ones work, as well as, blogging edicat! Thank you!!! Great info! I am getting ready to launch my website and this is an awesome tidbit of information. From keeping credit for ones work, as well as, blogging edicat! Thank you!!! Great info! I am getting ready to launch my website and this is an awesome bit of information. From keeping credit for ones work, as well as, blogging edicat! Thank you!!! Great info! I am getting ready to launch my website and this is an awesome tidbit of information. From keeping credit for ones work, as well as, blogging edicat! Great info! I am getting ready to launch my website and this is an awesome tidbit of information. From keeping credit for ones work, as well as, blogging edicat. Courtesy question: I’ve been wanting to share your blog with my readers. If I refer to a post (not copy it) and include one picture (with your logo and source info) to give my readers an idea of what’s here. Is that cool? Would most bloggers be ok with that approach? I want to get it right. 🙂 And, by the way, I love your blog! I have a question related to this. I saw a pin about a pillow. I visited the blog she said o loved this pillow, the website never worked so i made it and created a tutorial. As it turns out the website was a online store to purchase the pillow… Like etsy. The artist contacted the blogger and asked them to remove their tutorial because they were harming their business… The business of selling a $150 throw pillow. That doesn’t sound right to me. If you credit the inspiration… Give people the chance to buy it from the source and you created something from their idea… That seems like aPB hack mot theft… But maybe im wrong. Sorry for the typos. Silly phone autocorrect. I was trying to read this post but all the photos are blank. Just wanted you to be aware of this! Tks for sharing all this valuable info! Thanks for letting me know, Gina!